The Observational Medical Outcomes Partnership (OMOP) was launched to establish a common infrastructure and common data model which could accommodate observational data from heterogeneous sources around the world. The OMOP Common Data Model aims to standardize the format and content of observational data so that standard analytical applications, tools and routines can be applied to e.g., facilitate reproducible statistical analyses in epidemiological research and to create a framework for incorporating observational data into evidence based decision making. To find out more about the aims and current status of the international OMOP initiative, go towww.ohdsi.org<http://www.ohdsi.org/>. Replication of the OMOP experiment in European data has been started in some countries with promising results. The Centre for Pharmacoepidemiology (CPE), Karolinska Institutet, in collaboration with Janssen Pharmaceutical NV has started mapping the Swedish health care data to OMOP Common Data Model and the first version for the Prescribed Drug Register will be launched soon. The meeting will focus on the possibility of extending the Swedish OMOP team to involve different parties, such as governmental agencies, universities, contract research organizations or pharmaceutical companies. The main aim is to build a comprehensive team to map all relevant Swedish registers to the OMOP Common Data Model and enhance collaborative analytics through the standardized tools and data sets. 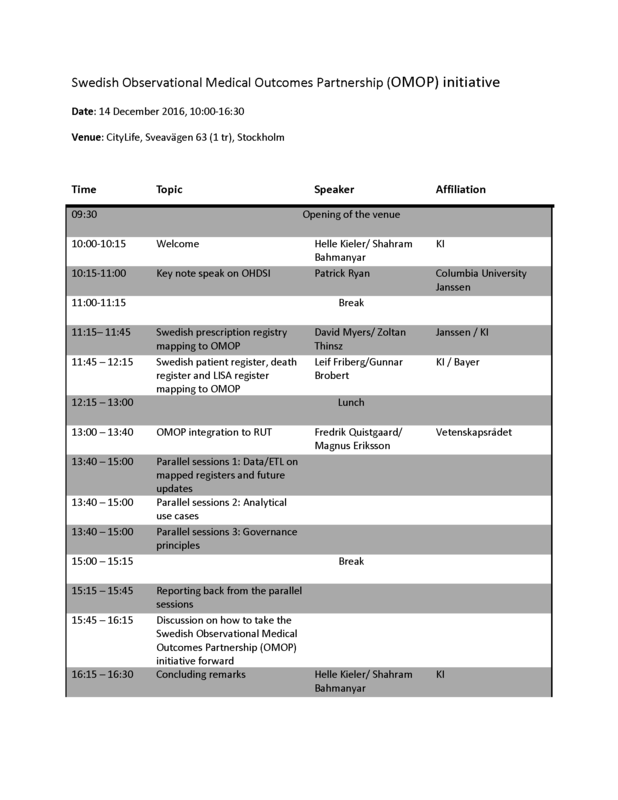 The day will include a showcase of existing Swedish mappings (version 0), a keynote presentation by Patrick Ryan (Janssen Pharmaceutical NV), invited talks on related Swedish standardization initiatives and a joint discussion about the road ahead for forming a Swedish OMOP community. To register, please see the attached invitation. A preliminary agenda for the day is attached.